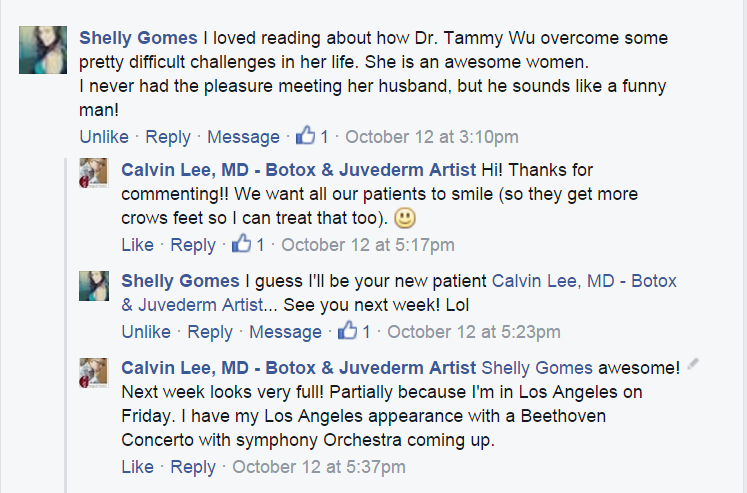 I had posted on my public Botox page on FaceBook about an article about Plastic Surgeon, Dr. Tammy Wu on Contentment Health Magazine. I’m happy to report that I have 1051 likes on that FaceBook page. 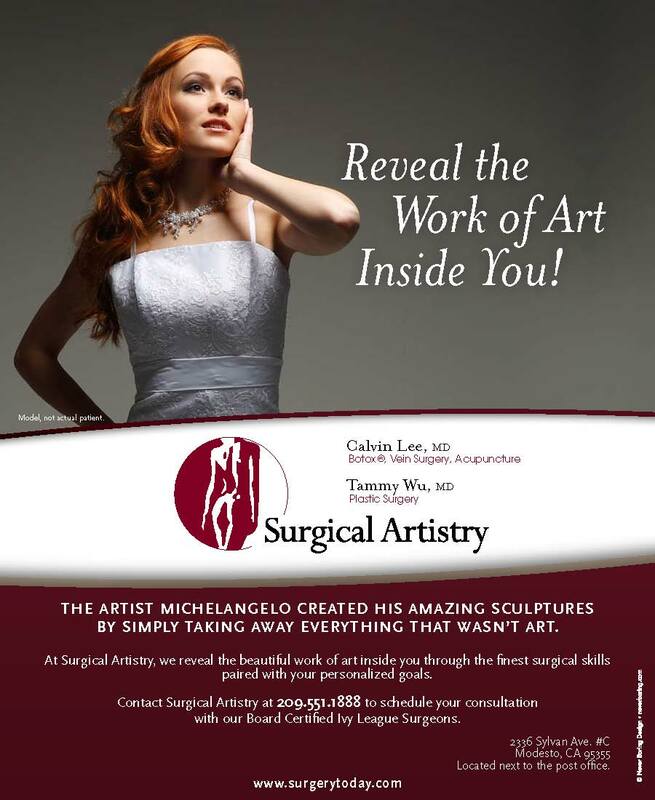 We have a separate Surgical Artistry page on FaceBook which has 1878 likes. All these pages are public and anyone with a FaceBook account can leave comments. Dr. Tammy Wu hard at work! 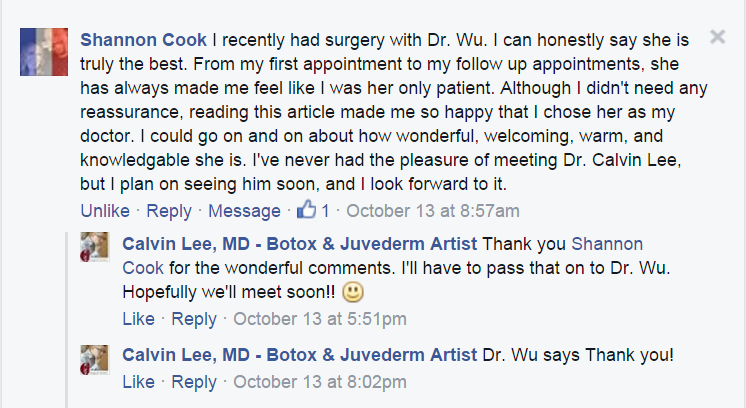 I wanted to share some of the public comments which were left under my public Botox page on Facebook with the link to that article about Dr. Wu. Thank you so much for all your support. My Modesto Botox website is www.InjectionArtistry.com. And our Modesto Plastic Surgery page is www.SurgeryToday.com. I have a question after reading your list of injectors in your area and out of curiosity why would a DDS need to do Botox injections? Hi! GREAT question!! Some of the best injectors of Botox I know in this world are Dentists!! They know facial anatomy very well. But one of the biggest roles that Dentists play with Botox is injections for TMJ / Jaw pain. Some of the injections are outside the mouth and some of those injections can be inside the mouth. So out of the concept of doing their jobs very well, many dentists have Botox in their stock, and it’s probably convenient for them to consider injecting cosmetic Botox in addition to Botox for pain. But I think due to the cost of Botox and short acting efficacy of reconstituted Botox (meaning it doesn’t stay fresh for a long time), it probably doesn’t seem to be financially a worthwhile thing to do for Dentists (and surgeons for that matter). 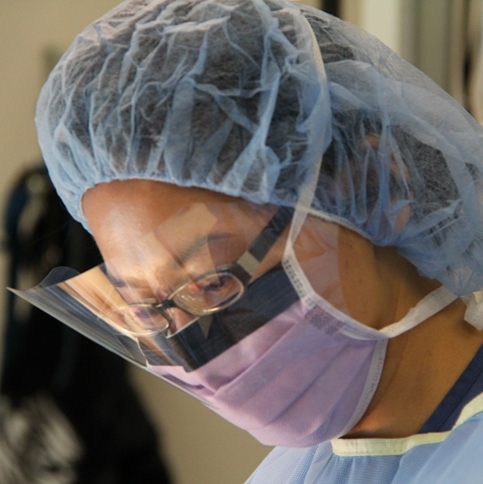 So most Dentists and Surgeons choose not to focus on Botox at work. I do, because it compliments my wife’s practice very well, and I’m all for supporting my wife’s plastic surgery practice. But if a dentist or surgeon wanted to inject Botox – I think they would do a very very good job, especially if they made it their primary focus at work for whatever reason. I hope this helps answer the question.